Posted on June 3, 2013 by Susan H.
I enjoyed a beautiful weekend away visiting my mother to celebrate her birthday. The perfect treat to bring along to my mother’s church for their coffee/tea meet and greet after the service…they loved them! This recipe comes from my neighbour, Linda…who in turn was given this recipe from a friend. I cut the recipe in half, adapted it to be dairy, soy and egg free and opted to bake mini muffins. 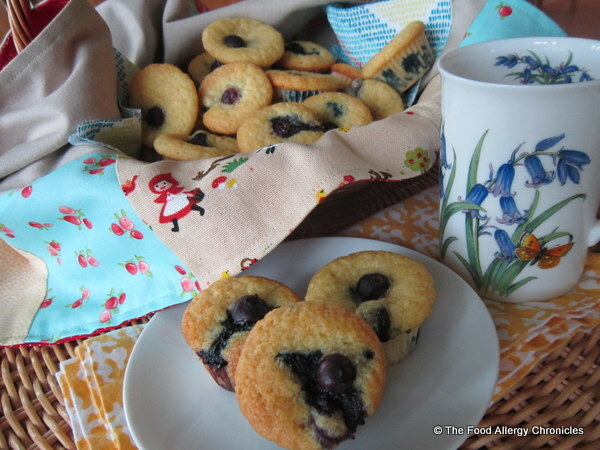 Did you notice the beautiful tea towel the mini muffins are wrapped in? Carla @ My 1/2 Dozen Daily sewed it for me. The ‘Little Red Riding Hood’ pattern was from a Scrap Swap Carla held. As soon as I saw it…I knew I needed her to sew me something with it. 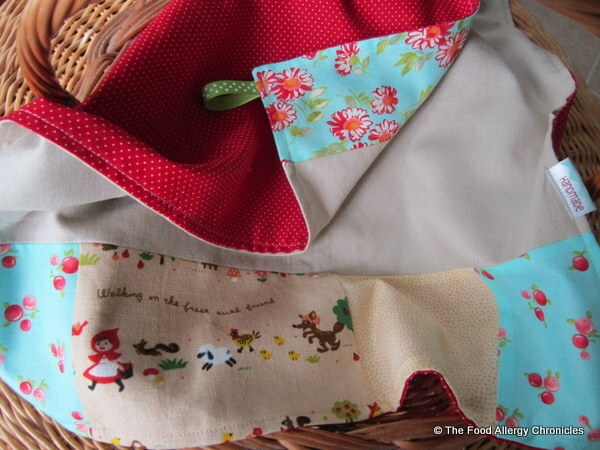 After my husband referred to me as ‘Little Red Riding Hood’…I went delivering my muffins in my basket through the neighbourhood last week…I knew just what Carla could sew for me…a patchwork tea towel for my muffin basket. In a large bowl, mix the dry ingredients (flour, cornmeal, baking soda, baking powder, sugar and lemon zest) excluding the blueberries. In a separate bowl, mix the wet ingredients (oil, lemon juice, vanilla and water) excluding the non-dairy beverage. Fill mini muffin tin paper liners with batter. Tip 1: I was able to fill a 24 cup mini muffin tin and then baked another 8. Bake at 350 F for 10 – 15 minutes. Let cool in muffin tin for 10 minutes before removing to continue cooling on cooling rack. Tip 2: Wondering what to do with the leftover lemon juice? I love it stirred into water for a refreshing drink or sprinkled over fresh fruit with a drizzle of local honey. 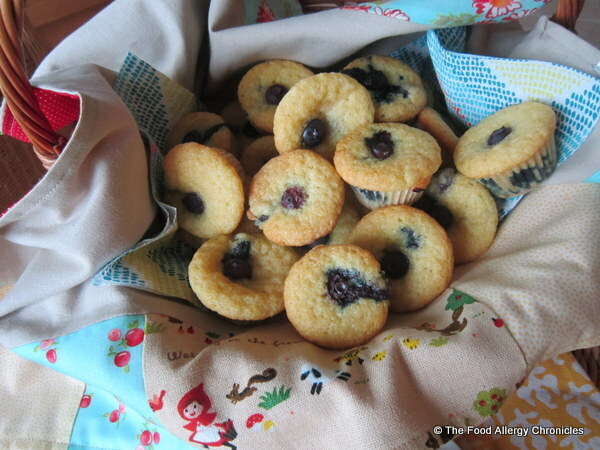 This entry was posted in allergies, baking, dairy free, egg free, muffins, multiple food allergies, peanut/tree nut free, soy free and tagged Carla @ My 1/2 Dozen Daily, Dairy Egg Soy and Peanut/Tree Nut Free Lemon Blueberry Cornmeal Mini Muffins, Natur-a Rice Beverage by Susan H.. Bookmark the permalink. Wow your boys are so lucky! Always baking delicious looking treats! They turned out great didn’t they!? They look delicious! The cookies you gave the girls were gone probably before you got to your moms.. .hahaha!! The tea towel looks great! 🙂 So glad you like it!